Ionic Framework for Mobile Application Development. Reasons to choose. The excellence and popularity of mobile apps development on IT market is more than apparent. So all modern companies in case they want to compete for customers have to take this fact into account. That is why they always have to enhance their product in order to supply customers with up-to-dates and easy in use applications. Moreover, they must always find new approaches to reduce resources that are needed to provide all the functionality of their products. One of the hardest and most important decisions for such companies is to decide what stack of technologies will be used for development of their applications. Once app development appeared, native apps used to dominate over hybrid ones due to some drawbacks in hybrid apps like slow laggish performance or not interactive design. Nevertheless, their reputation was dramatically improved few years ago, when Ionic platform has been published. Nowadays the situation changed and hybrid apps stepped into a new era with an advanced functionality and popularity of multiplatform apps. Below are some elements why we need to choose Ionic mobile app development. There is something like a stereotype connected with open code development. It is said that it is always an immature platform which may break any moment, so that, you would have to waste a lot of time handling different errors. But don’t become disappointed. Just try to work with Ionic and you will see that it is rather fast, stable and safe. Moreover, it can effectively duplicate a native feel. Let’s be honest, application development is rather consuming thing in question of money, time and creativity in all spheres: research and inventing, design and development, marketing and supporting. Your potential framework is able to eat all the resources you had before starting the development and make your wallet really light weight. On the other hand, Ionic is more than simply cheap framework. It may cost you nothing except a salary of your staff. Moreover, you can learn it yourself and work on it accordingly. In that case Ionic is as simple in learning as making a web page to work in app-shell. Try to find someone who is not fond of making an UI which you can design by choosing and combining different elements and do not waste costless time on coding each one separately? Moreover, exactly because you cannot find such a person, Ionic is worth your attention. Its advantage is in possibility of using a list of already written UI elements. So that, different forms, filters, action sheets, menus, bars and other UI part are available for a coder to apply them. In addition, there is the greatest benefit – as developers can concentrate on writing a stable running code instead of wasting time on UI designing. Moreover, as the code is open, it can be reused for anything you need in future. And at the same time you are able to use CSS classes to personalize your UI. We all know that it might be hard to start working with a new framework even for professionals. Nevertheless, large and friendly Ionic community will not leave you in trouble alone. 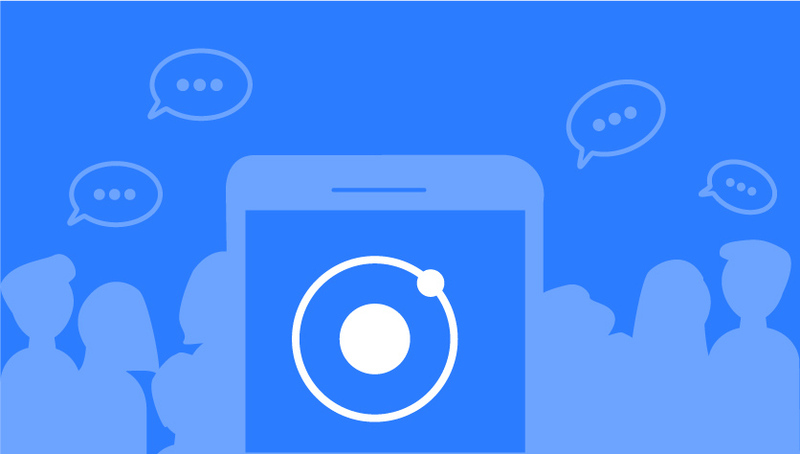 Ionic is much sought after by developers as it’s built as an addition to such giants as Cordova or Angular, so do not worry, the community is enormous and always ready to respond. That is why you are able to find all the answers on all questions you have in some blogs, single posts, forums or even in a private chat with some other developer. Moreover you even may try to get an answer from Ionic founders by posting your issue on Facebook, Twitter, Stack Overflow etc. If you a going to build a native application for Android as well as iOS you must be aware of its timewise side. You have to learn two absolutely different languages with different syntaxes in order to probing your consumers a stable modern app with convenient UI. Nevertheless, the era of flexibility in question of building such apps comes with Ionic. Nowadays to develop an application with high quality and full of various functions User Interface and use the same code to build an app for both platforms itself is much easier so you can save your time and energy. Do you know that short parts of a code, usually in Java Script, which is connected to your app and make it performs like a native, are plugins? Ionic users are fond of Cordova plugins that enable access to various possibilities in operating system such as pro-location, access to logs, camera etc. This small pieces of an additional code can improve the performance of your app. And the last but not the least – testing is also more convenient with Ionic. You are able to run an app on a desktop browser or in special simulator simultaneously for both platforms with Cordova commands. Moreover, you are able to use mobile browser or iOS safari for it. Imagine direct testing on the platform for native or hybrid apps – you can do it with Ionic! So, you can form an image how it works on the certain platform. Remote debugging is also one of the biggest pros in testing Ionic apps. Ionic was invented in order to break the wall between AngularJS, Angular 2+ web development and hybrid mobile applications development. It comprises advantages of both the loaded AngularJS, Angular 2 + and Cordova library and use them for creating really unique and superb cross platform apps with an interactive UI. The last version of Angular 6 presents new features for this JS Framework and not only that make your development easier and faster. The article that is dedicated for those who is interviewing Angular developers to choose the best match.